Over the last 3 years (iPhone3G in 2008, iPhone3Gs in 2009, iPhone4 in 2010) I had spend a serious amount of money in the AppStore (w/ Navigon Europe for €89 being my most expensive App). I had at least €200 worth of Apps on my iPhone4 in september 2011 when Apple did not give me the larger iPhone5 I wanted/needed. Nevertheless the lock-in relation I had with the iTunes AppStore I decided to give other platforms a chance. The most important reasons to move away from iOS start looking around: I was expecting the larger screen iPhone5 and I was heavily disappointed when they showed just the 4s. But more important I was very disappointed in iCloud/MobileMe: not your own email domain (always a @me.com-address), iCloud's Agenda/Mail/Contacts are incompatible with everything out there other than Macs (apart from a 1990s type of synchronization in Outlook) so they already forced me to switch entirely to GoogleApps. And that's were I started to look to Android. 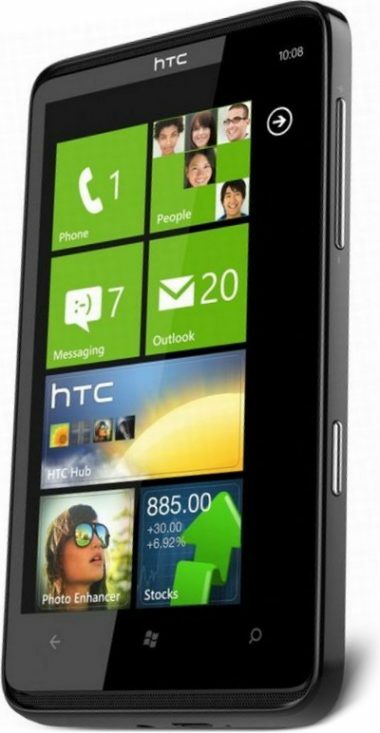 But first I played for about 3-4 weeks with an HTC HD7 w/ Windows Phone 7.5 Mango. It was a true disappointment, apart from the particular interface I couldn't get used too there were no Apps available that could satisfy me. apart from email, agenda and calling my phone needs a good Twitter App... and for WP at that time (October 2011) there was nothing. the WP-designs were too slick and lean. I hope to give the Nokia Lumnia 920 w/ WP8 a try soon to see how HW, OS and Apps have developed in a year time. So after my short flirt with WP I bought an Android device, the Google Samsung Galaxy Nexus, now 9 months ago (hence the title od this blog). No HTC Sense or Samsung TouchWiz skins to ruin the work of Google's programmers, the real stuff, Google's Android Vanilla interface. 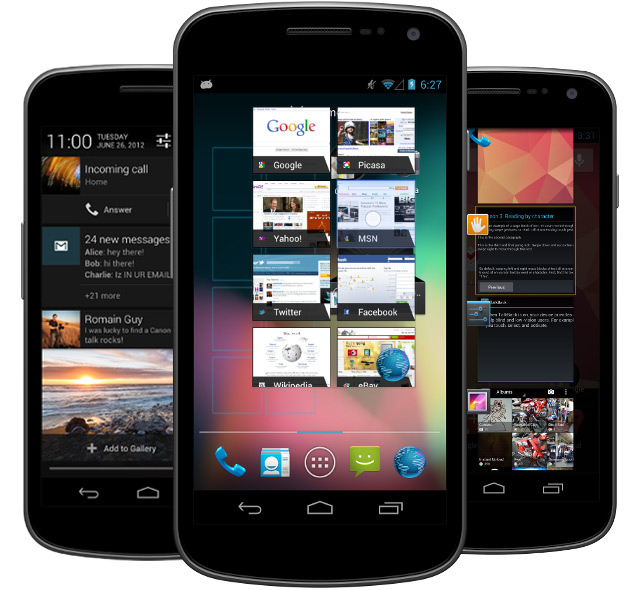 It was the the first Android device with OS 4 Ice Cream Sandwich. And OMG how I regretted my choice for at least 1-2 months. OS 4.0.0/4.0.2 was still very buggy (unstable Wifi connections, OS-crashes, Apps crashing). Only when 4.0.4 came I could relax and everything finally worked as I expected and I started to enjoy Android. Since 2 months there's JellyBean available for the Galaxy Nexus and it is fantastic, a few neat enhancement/improvements but above all a much smoother interface, for sure better then iOS5 on any of the iPhones I've seen (so that excludes the latest iPhone5). Would I do this switch again? Knowing what I know now: yes, for sure! The integration with the Google applications (Gmail, GDrive/Docs, Picasa, etc) is perfect, I love the flexibility of Agenda/Calendar, Contacts and Email. I wouldn't be able to live again with iOS shortcomings such as having to launch the Calendar-App to see if you have any upcoming appointments (why not on the lockscreen?) or the lack of a some simple buttons (widgets) to switch WiFi on/off, or datasync (in case of roaming), etc. I would probably end up jailbraking the iPhone again (as I did with all my iPhones) in order to get the iPhone to do what I want it to do. In fact one of my best read blogs ever (from Dec 2009, in Dutch) is about how to get more out of the iPhone. But my experience with Jailbraking is that it does make the iPhone unstable (not the JB itself, but some Cydia Apps do). I had to (soft)reboot at least once or twice a day. Now to the Apps: I like to play around and test a lot of Apps, just for fun. I do not hesitate to buy any App cheaper then €1,99 if I think it could help me and if there's no Free version to test available. So I have spend already a lot on Android Apps as well (all from the official Google Play Store), probably around €100 in a year time. I have seen the Android Apps grow, they're getting mature. But there's also still a lot of rubbish in Google's Play Store, more then in the iTunes AppStore is my impression, especially from a design point of view. For almost all of my iOS Apps I found (cheaper/free) alternatives on Android. 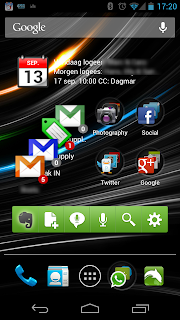 All my key Apps work perfect, look great on my Galaxy Nexus. For a long time I have been searching a Twitter App that could match the design, versatility and functionality of TweetBot (only available for iOS) but the latest version of Plume and the final version Boid are very promising! Switching from iCloud to other alternatives is easy and you only get more functionality. Both Dropbox and Google Instant Upload offer a better alternative to PhotoStream. Better since it's far more easier to get access to your "photostream" from other platforms, my main problem with all Apple-Apps is they offer no or bad support for other platforms then iOS/OSX. Gmail has always been better (and more versatile) then your @mac.com/@me.com account, accessing a Google Agenda is possible from anywhere and from a wide range of devices/apps and you do not need an iPhone to get access to a shared agenda. Google Drive/Docs and all the plugins/extensions make your life a lot easier. PS: my wife and kids still use all those iOS-Apps I bought over the years on my 3 old iPhones and iPad1. And I still haven't replaced my iPad2 with an Asus Nexus7 so on the couch I can still enjoy TweetBot! Very prompt and pleasant customer service Riparazione iPhone. Offers high-quality items for the phone and are guaranteed with regard to 90 days!! Even throws in a complimentary, tempered cup!! This can be a type, truthful repair center that is hidden away from everything and everybody! It is really a rare jewel. Excellent, truthful service for a fair price Iphone Restore ….